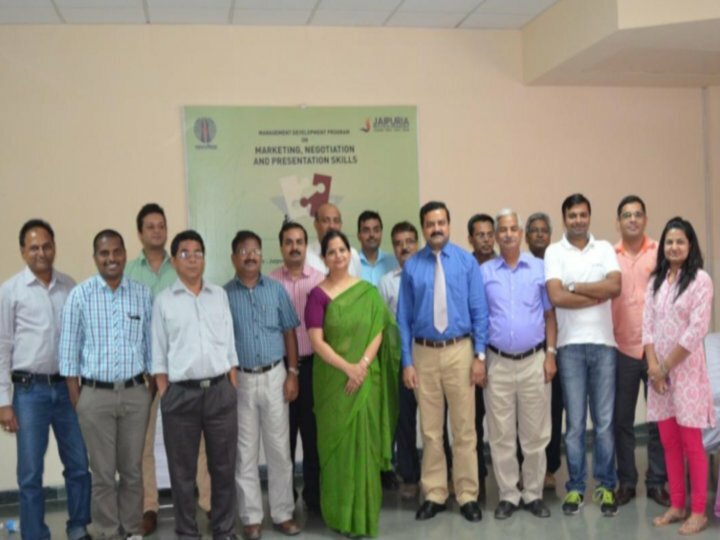 A three day MDP on “Marketing, Presentation and Negotiation skills” was organized by Jaipuria Institute of Management, Jaipur Campus. 13 participants at Chief Manager and Manager level from various departments like Marketing Telecom, Consultancy, Transmission, Engineering, and HRD etc. from Power Grid Corporation attended the program. The MDP was inaugurated by Dr. Prabhat Pankaj Director Jaipur Campus. The Inaugural session began by seeking blessings from Goddess Saraswati. Dr. Prabhat shared the importance of continuous learning through formal and informal learning. He also shared the Jaipuria Legacy, PGDM program and various initiatives like UN campus, Extensive Corporate Interface for the students, Mentoring for students, Quality Education, Faculty Development Programs, Managerial Development Programs and training and Consultancy undertaken by the group. 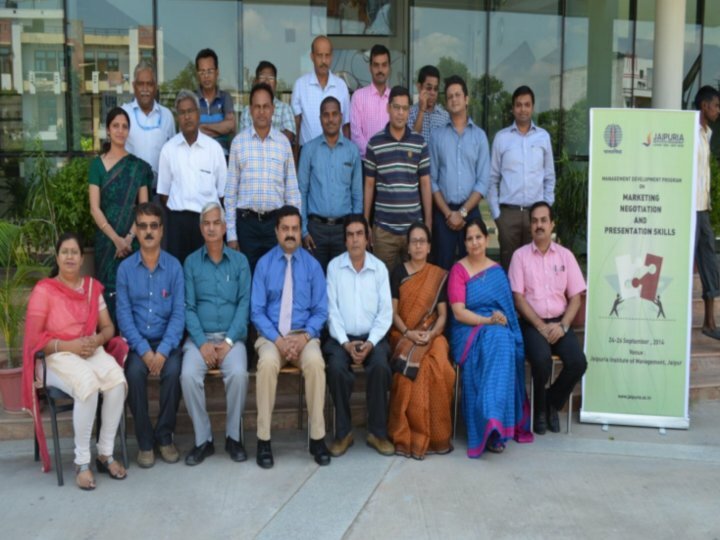 The facilitators of the MDP were from various domains with rich experience as well as internal Faculty subject matter experts from Area Marketing and Business Communication from Jaipuria Jaipur.Prof. Saurav Banerjee, Dr. Swati Soni, and Dr. Shubha Johri imparted sessions on Marketing and B2B. Dr. Vanadana Sharma took sessions on how to improve presentation skills and Dr. Nidhi Vashishth conducted various excercies to enhance effectiveness at workplace. 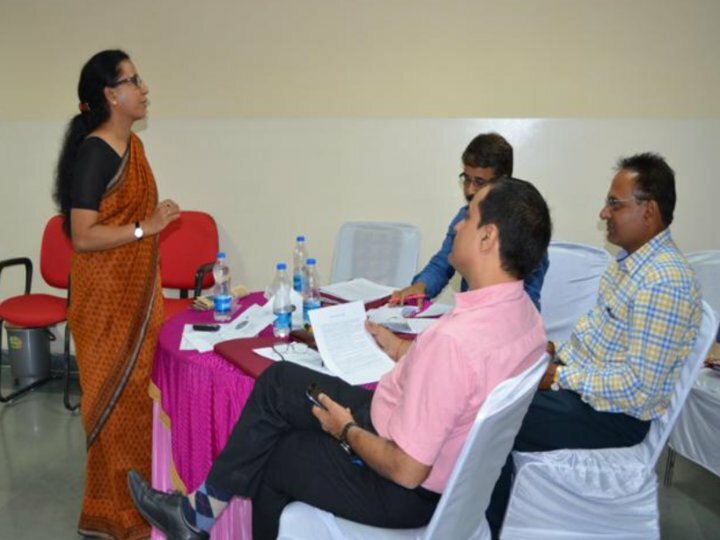 Prof. Neerja Gupta –Central University Kishangarh took valuable and interactive sessions on negotiation and conflict management skills. The pedagogy of the MDP was Case analysis based, interpersonal experience sharing, group works, video based group work working up on challenges presentations etc. Overall the MDP was a great success in terms of the cohesiveness of the group, interaction throughout the day and relevant discussions upon how the Competency Based systems can be designed and implemented in organizations. The MDP was successful due to the support of our Director Dr. Prabhat Pankaj, the administration team led by Dr.Vikas Indoria, Shri. A.K Tiwari, Mr. Kumar Sriuttam and Ms. Shalvi Sharma for her support from the beginning to the end. The Jaipur MDP Team looks forward to have many such sessions in coming years.